On the 9th (Sat), admire the natural beauty at Garden of the Sleeping Giant, then explore the striking landscape at Sabeto Hot Springs and Mud Pool, and then hunt for treasures at Nadi Market. 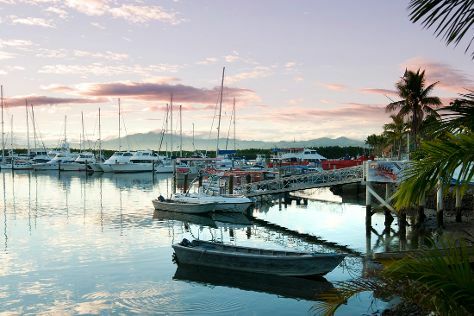 On the 10th (Sun), you'll have a packed day of sightseeing: enjoy the sand and surf at Denarau Beach and then take in the waterfront activity at Port Denarau Marina. To find reviews, photos, traveler tips, and other tourist information, go to the Denarau Island trip itinerary maker tool . Singapore, Singapore to Denarau Island is an approximately 15-hour flight. Due to the time zone difference, you'll lose 4 hours traveling from Singapore to Denarau Island. Expect a bit cooler temperatures when traveling from Singapore in June; daily highs in Denarau Island reach 33°C and lows reach 23°C. Finish your sightseeing early on the 10th (Sun) so you can travel to Suva. On the 11th (Mon), hunt for treasures at Municipal Handicraft Centre, browse the different shops at TappooCity, and then hunt for treasures at Suva Municipal Market. For traveler tips, other places to visit, maps, and more tourist information, you can read our Suva trip itinerary app . You can do a combination of flight and taxi from Denarau Island to Suva in 1.5 hours. Another option is to take a bus. Traveling from Denarau Island in June, Suva is a bit warmer at night with lows of 30°C. Finish your sightseeing early on the 12th (Tue) to allow enough time to take a bus to Sigatoka. Kick off your visit on the 12th (Tue): look for all kinds of wild species at Kula Wild Adventure Park and then stop by Baravi Handcrafts. Get ready for a full day of sightseeing on the next day: surround yourself with nature on a nature and wildlife tour and then kick back and relax at Natadola Beach. To see photos, ratings, other places to visit, and tourist information, read our Sigatoka road trip app . Take a bus from Suva to Sigatoka in 3 hours. Alternatively, you can do a combination of flight and bus; or drive. Traveling from Suva in June, expect slightly colder with lows of 23°C in Sigatoka. Wrap up your sightseeing by early afternoon on the 14th (Thu) to allow enough time to travel back home.